I’m a big believer in story. Several years ago I made a 365 Project that was all storytelling based, because it’s a topic that really intrigues me. I love creating photographic stories. I find storytelling inspiration through studying paintings and painters of the past. Norman Rockwell has allowed me to see things differently in this world. His illustrations show an idealized version of life, the world as he wanted it to be. Norman Rockwell used photographs to help him tell stories. His images started with a concept, were photographed by photographers he worked with, and then through a combination of tracing and his incredible painting techniques, he created the finished image. This is what I try to do with my work through Photoshop and compositing. I create several images and then arrange them in a way that allows me to layer them and create the story I want to tell. I am a photographer (because by no means do I have amazing artistic painting technique) but the key is where you start with a composite. You and I start at the same place as good ol’ Norman, with a story in mind. Trust him, he’s a genius of using common places and common people to tell simple stories with emotion and paused action. The simpler the story the better: Norman’s paintings were detailed, but the action was always simple. Story is how we relate to one another in visual or literary ways. In my opinion it’s what gives a photograph purpose. What story do you want to tell? That is the first question we all struggle with in our work. Headshots need to tell a story of trust or peacefulness, or warmth, or coldness for that matter (think about the actor who plays a villain). In Rockwell’s paintings it was usually a look that told the whole story. What are we trying to convey to our viewer? How can we create an image that others can relate to in their own lives? How can that most simply be conveyed? These are some of the questions I ask myself when developing a new piece. Look around the room right now. There are objects there; choose one object. Think of any emotion. The location is the room you are in right now. You are the subject. How do you interact with that object and why? Just try it for a second. You’ll have an idea. You may think it’s crummy or dumb or genius. Any of those thoughts are okay to have right now. Just choose one…be it silly, serious, playful, or any number of things. Look at this list of emotions below to find one if you need help. After choosing subject, object, location, and an emotion, I draw up a little sketch of what I’ve come up with and see if it is feasible to do. Below are some simple sketches for a 365 Self Portrait Project I did awhile back and what they became. This is how they turned out in the end. They aren’t identical, but they are pretty close to what I had been thinking when I designed them. This is one of my secrets for compelling imagery; find the moment with your subject where they are in the middle of a compelling emotion. Viewers of art like creating their own stories based on our imagery. It is compelling to guess what is happening next in a visual story. Miss the apex of the emotion, just before or just after, and we are told too much or too little about what is happening in the scene. Allow people’s minds to fill in the gaps. Try to find examples of this in some of Rockwell’s paintings and then make it happen in your own work. Some other examples of when I was inspired to do this is when I was living in NYC. I was living in a small apartment and found inspiration there all the time even in one room. Below are some of the concepts I used in one location and changed my viewpoint to shake up the way I saw the same room. All 17 of the above images were done in the same room. Look up, look down, look around a corner; different concepts, different emotions and different props can entirely change a story. Usually I didn’t spend money on props, it was all what I had in the room at the time (I’m weird, I know). Most of these are based on an emotion of some sort: sadness, surprise, wonder, relaxation, terror, loneliness, etc. Through changing the subject, emotion, or lighting, I was able to completely change the story. Norman Rockwell has allowed me to see things differently in this world. His illustrations show an idealized version of life, the world as he wanted it to be. This is what I try to do with my work, albeit in a different way. What does the world look like through your eyes? What commonplace object, location, or subject that you encounter every day could contain the most extraordinary image if you looked at it slightly differently? What if you added a different subject, a random prop or a different emotion? Be curious. Be appreciative. Show others the way you see the world, one story at a time. Thank you Scott for inviting to share my view of photography and Photoshop. Your introduction into this world gave me my inspiration to become what I’ve become today. If you have any questions feel free to reach out and ask! 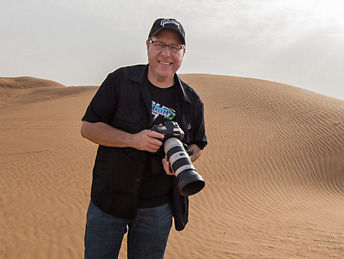 Find Kirk on Instagram, check out his photography at KirkMarshPhotography.com, and check him out at KirkMarsh.com!